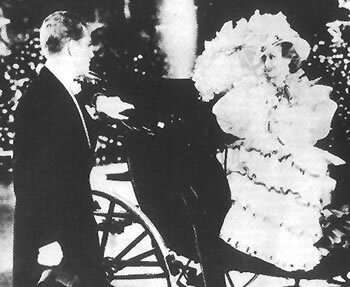 Nelson Eddy’s “Dancing Lady” to air on TCM tonight! Midnight Eastern time, 9 pm on the west coast, catch Nelson’s one number in this 1933 Clark Gable-Joan Crawford starrer. When people wonder how/why Nelson and Clark Gable became friends, this was the original connection. In later years, Nelson mentioned Joan Crawford (pictured with Nelson above) to one of his lady friends, recalling a Hollywood party in which Crawford stripped naked and danced on a table! Welcome to Hollywood, Nelson!